“You can also use it for pressure cooking, slow cooking, and cooking eggs." If you don’t make rice on a daily basis, it might make sense to get an appliance that can cook more than just rice. 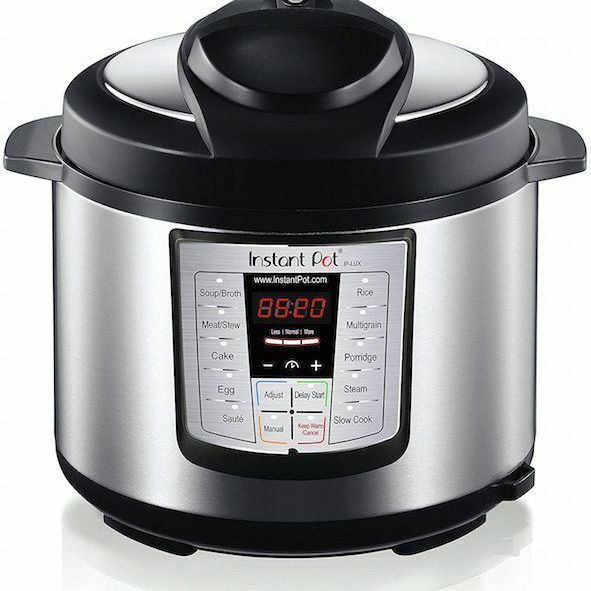 While the Instant Pot can cook rice for sure, you can also use it for pressure cooking, slow cooking, and more. The updated model for 2017 now includes settings for cooking eggs, which has been a popular function among users. It also has a new button for cakes, like cheesecakes or moist-cooked carrot cake or banana bread. This can also pressure cook for up to 240 minutes and you can set it to silent mode, so the beeps won’t disturb you. There is a cooking delay for up to 24 hours, and it has both an automatic keep-warm and a manual keep-warm setting for up to 10 hours. This does not have a low pressure setting. The inner cooking pot is stainless steel, so it’s dishwasher safe and there’s no need to worry about using metal utensils. If you’re looking for a solid rice cooker that will fit most kitchens, this is the one to choose. It is a smart rice cooker with a micro-computer that adjusts the power depending on how much rice is being cooked. This means the rice is cooked perfectly every time, whether you’re cooking rice for one person or for your whole family. While the cooker is a smart model, the controls are very simple to use, with icons on the buttons for selecting white rice, brown rice, porridge or soup, or the quick-cooking or steaming setting. It has an auto-shutoff, and can keep rice warm for up to 12 hours after it has been cooked. It comes with a steaming basket, rice paddle, and a measuring cup. The power cord is detachable for safety and storage, and the interior bowl has a nonstick coating for easy cleaning. If five cups of uncooked rice (which yields about 10 cups of cooked rice) isn’t enough, there is a larger model that can handle up to10 cups of uncooked rice. For those who eat a lot of rice and a wide variety of kinds that require a range of cooking methods, this cooker might actually do a better job than you could on the stove. It uses induction cooking that heats the bottom, sides, and lid of the pan, and it can make precise adjustments to the cooking temperature to make perfect rice every time. The cooker has settings for white rice (regular, softer, or harder), jasmine white rice, mixed rice, sushi rice, porridge, sweet rice, brown rice, GABA brown rice and for quick-cooking. There are two keep-warm settings, one for holding rice for a short time when dinner might be delayed, and another for keeping the rice warm for longer than eight hours. The extended keep-warm uses a slightly lower temperature to keep the rice from drying out and can hold the rice for up to 24 hours. The cooking pot has a nonstick coating for easy cleaning, and the cooker includes a measuring cup and rice paddle. The cord is retractable for storage. This unit will cook up to 1 liter of rice (about 5 cups); there is a larger model that can handle up to 1.8 liters. If you need the appliance to do even more, there’s a similar model with a higher price that has pressure cooking ability. This high-end cooker comes with a high-end price that might only be worth it for people who are very passionate about their rice. This wallet-friendly rice cooker includes a basket for rinsing the rice or for steaming foods in the cooker and has a removable nonstick cooking pot for easy cleaning. It holds up to eight cups of cooked rice to feed a crowd. Operation is easy, with just one button to turn the machine on to start the cooking. When the rice is done, it automatically switches to a keep-warm setting, so the rice will be waiting for you, even if dinner is delayed. Besides making rice, you can cook whole grains or use the steamer basket for vegetables or fish. For easy cleaning, both the cooking bowl and steaming basket are dishwasher safe, while the lid is removable for hand washing. A carrying handle makes it easy to move or store. A measuring cup and rice paddle are included. Sure, you can cook rice in a standard pot, but a pressure cooker does it easier and faster since pressure cookers work up to 10 times faster than normal cooking methods. Even better for your wallet and your storage space, a stovetop pressure cooker is a multi-use item that you can use every day. If you don’t pressurize the pot, you can use it just like a standard sauce pot, so it can be used every day. This has a six-quart capacity and is made from stainless steel that’s rustproof, nonreactive, and stain resistant. It can be used on any type of stove, including induction, and it has a helper handle to make it easy to move. During pressure cooking, the pressure regulator maintains the proper cooking pressure automatically, and the cover locks securely while under pressure with a sealing ring that keeps the steam inside the cooker. An over-pressure plug releases pressure if it builds too high, for safety. If your goal is to cook a lot of rice without a lot of fuss, this 10-cup cooker will make up to 20 cups of cooked rice at one time and it comes with a modest price tag. It has presets for white rice, brown rice, slow cooking, and steaming, and has a delay timer and a keep-warm setting. It includes a measuring cup, rice paddle, and steaming basket. The cooking pot has a nonstick surface and can be washed in the dishwasher. For an easy way to cook rice that doesn’t involve yet another countertop appliance, this microwave cooker is ready to produce perfect rice in your microwave. The cooker has an 11-cup capacity, so you can make rice for a crowd, and the steamer plus pressure chamber design produces fluffy rice every time. Locking clips hold the lid in place during cooking, while steam vents release steam without spatter. Side tabs stay cooler and make it easy to remove the cooker from the microwave when cooking is done. We bought a top-rated rice cooker that our reviewers spent 10 hours testing. To get the most comprehensive results, they set it up in their kitchens and cooked multiple types of rice using different settings. We asked our testers to consider the most important features when using this rice cooker, from its capacity to its footprint. We've outlined the can’t-miss points here so that you, too, know what to look for when shopping. Capacity A rice cooker’s capacity is usually measured in the number of cups of uncooked rice it can hold. Be sure to note, though, that depending on the type of rice, you might end up with twice that amount of cooked rice — so choose an option that’s the right size for you and your family. Presets Many rice cookers come with presets for different types of rice, as well as ones that include adjustments for making your rice softer or firmer than usual. Basic cookers, on the other hand, might just have an on/off toggle with no additional settings. Which do you prefer? Extra features Besides being able to cook different types of rice, some units venture beyond grains and can be used as slow cookers or steamers for vegetables or fish. If you don’t cook rice regularly, those extra features might make a rice cooker more useful more often. This cooker appealed to our testers because of its versatility. “Not having to own two devices — especially when both take up plenty of kitchen space — is a big benefit for anyone with a smaller kitchen. The pressure cooking is also pretty great. Speeding up cook time for really time-intensive food items is very nice.” One reviewer also felt that this cooker was easy to clean and a good tool for cooking large amounts of rice. On the flip side, it took a minute to figure out how to use it correctly, according to one tester: “I think there are too many buttons and there’s a somewhat steep learning curve for what does what on the device,” he said. One of our reviewers also noted that it was too large to fit into any of his cabinets, and that he ended up storing it on top of his fridge.